Many years ago, two glaciers collided in Southeastern Wisconsin and left behind a 22,000 acre playground known as the Kettle Moraine State Forest. Pines, hardwoods, prairies, and springs cover the moraines, kettles, kames, and eskers that make this area so special. Not far from Milwaukee, Madison, and Chicagoland, there is lots of fun to be had for everyone. 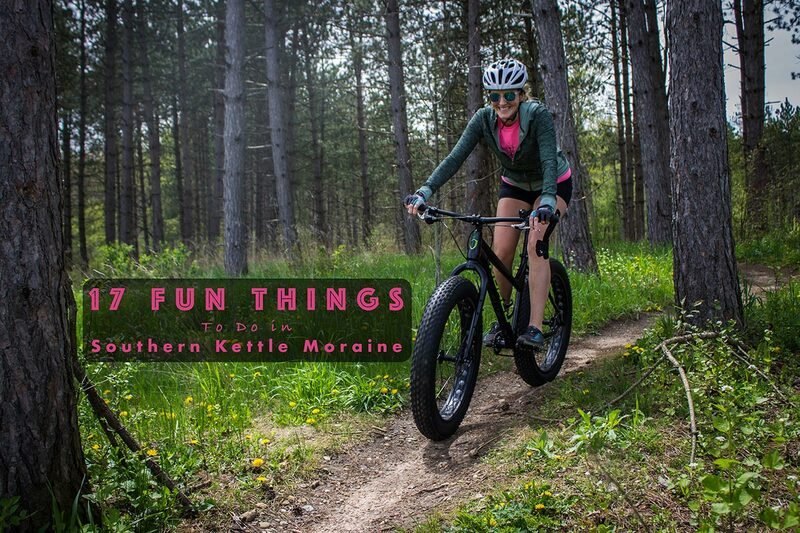 Let us help you to Get Outside and Play in the Kettle Moraine State Forest! XC Ski Lessons, Mountain Bike Lessons and Guided Tours, Stand Up Paddle-Canoe Tours and Sunset Cruises! Feel the Forest! Be the Forest! The Southern Kettles are home to 4 amazing trail systems. The Nordic, McMiller, Scuppernong and Lapham Peak. Impeccable grooming and cozy heated shelters at every trail! The Kettles are Mountain Biking Heaven! We have 60 miles of purpose built single track! The John Muir-Connector-Emma Carlin Trail System has something for everyone. The John Muir trails have a nice variety of beginner to advanced trails, the Emma Carlin is more difficult and technical. The Connector Loop is a one way trail connecting the two. Ride the “Full Monty” for 40 miles or spin the beautiful 1.5mi Brown Loop at the John Muir! The IA Trail is a 1200 mile trail that runs from St. Croix Falls to Sturgeon Bay. 42 of those miles pass through the Southern Kettles, running from Lapham Peak State Park to Whitewater Lake State Park. There are many access points in the Southern Kettles so you can take a hike or plan an overnight backpack trip. The IA Trail is the site for two national renowned Ultra Marathons, The IA 50 in May and the Kettle 100 in June. “The Store” as the locals call it, is in a historic building with an incredible deli, a great beer selection, unique gifts and gobs of atmosphere. The Store is on the edge of the State Forest, offers high quality ski and bike rentals, and has a full bike shop too. This is a destination all in itself and a must do when you’re out exploring the Kettles. A flat and paved trail gives access to a historic springhouse, trout stream, and pond. Sadly, in 2015 the dam failed and the pond largely drained. It’s still a beautiful spot and there is an effort to raise the $300,000 needed to rebuild the pond. This is a beautiful and challenging 3.86 mile hike to a very large erratic boulder that, if you squint a little, looks like an elephants head. It was carried here by the glaciers many years ago. In the 1920’s, folks visiting the therapeutic springs in nearby Palmyra, took horse drawn day trips to the Elephant, but today you gotta earn it with a hike. You’ll go up and over Bald Bluff, one of the highest points in the county, and a place with a cool history of its own! Park at the Bald Bluff lot on CTH H, just north of Young Road. If you golf, you must play a round at this historic course. Established in 1893 it’s Wisconsin’s oldest course and is still owned by the original family! 5th generation owner Mike Bolan, has made preserving history as important as providing an excellent golf experience on the shores of Eagle Springs Lake. HINT- The vintage club house is reason enough to drop in for a cold one! There are beautiful DNR Campgrounds at Whitewater Lake, Ottawa Lake, and Pine Woods. Make reservations early. We have 87 miles of trails laced through The Kettles. There are numerous stables in the area for horseback rides. If you are a horse owner, there is Horse Riders Campground in Palmyra where you gotta bring a horse to camp! Tucked in the woods off CTH H. What a cool spot! They have trout ponds for fishing, a seafood store, and an excellent restaurant. 3 miles west of Eagle, you’ll find Southern Kettles Headquarters and Nature Center. There are pretty hiking trails right there, an indoor nature center, and info on a variety of educational nature walks. Cool little gift shop too! McMiller is a full service shooting range. They have ranges for pistols, rifles, shotguns, and sporting clays. A complete Pro Shop, gunsmith services, and gun rentals too. There are many trail systems in addition to the iconic Ice Age Trail. Check out the Nordic Trails on CTH H in LaGrange, Scuppernong on Hwy ZZ East near Eagle, Scuppernong Springs on Hwy ZZ West, across from Ottawa Lake and Lapham Peak in Delafield. Old World is an open-air museum located near Eagle. It depicts housing and the daily life of settlers in 19th-century Wisconsin, with separate areas representing the traditions of different ethnic groups who settled in the state. Costumed interpreters portray the occupations and chores of typical settlers of the time. Running between Wisconsin’s two largest urban areas, this trail stretches for 52 miles through farmlands and glacial topography. The trail runs from Cottage Grove to Waukesha on an abandoned rail corridor. It’s paved from Waukesha to Dousman, and crushed limestone after that to the west. Don’t miss MaMa D’s in Wales for Coffee and Sandwiches. The Bicycle Doctor in Dousman is right on the trail for bike rentals, a great beer selection, and a very cool place to relax after your spin. Lapham Peak is near Delafield on the northern end of the forest. The focus is the 45ft lookout fire tower built on the peak. There is a wonderful trail system ranging from the very steep and challenging Black Loop, to a 1.8mi paved Plantation Loop. In the winter there is a lit cross country ski loop with snow making!